Lords and Ladies of Darkshine! Our mages, alchemists and smiths have collaborated and developed new ways to improve your Castle’s structures! Now, several of your Buildings can be upgraded to new Levels – several of which grant very special military and economic advantages. You can explore these types of building Bonuses by viewing the "Bonus" section in the Info tab of your Buildings. - Upgrade the House of Lords to a new Level in order to hold additional Shrines AND Hamlets! From now on, the House of Lords influences the number of Hamlets you can hold as well as the number of Shrines. - Upgrade the Forge to new levels and further increase your Castle’s Iron production! - Upgrade the Spring of Life to new Levels and grow your Food stockpiles even higher! - Upgrade the Embassy further to be able to hold even more Alliances! 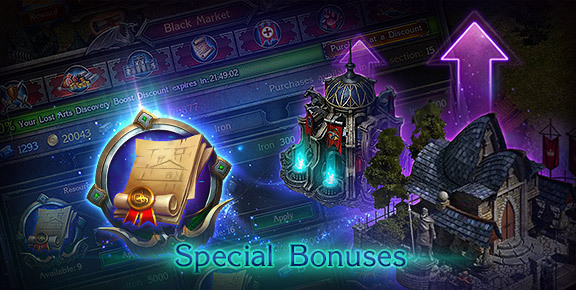 Plus, Special Bonuses unlocked at Levels 21 and 22 will allow you to hold additional Sarcophagi in your Castle. This will allow you to raise more Wraiths for your army! - Upgrade the House of Scrolls to new levels to further increase the speed at which you Discover and Upgrade Lost Arts! Furthermore, Level 22 grants a Special Bonus: a permanent increase to the amount of Experience you gain in combat! - Upgrade the Catacombs to new levels to further increase their Resource holding capacity. Levels 23 through 26 also grant Special Bonuses: Units will be automatically sent to the Catacombs as soon as they are trained! Please note that no extra Level has been added to the Town Hall. Having a Level 22 Town Hall will grant Lords and Ladies a Special Bonus: a permanent increase to the amount of Experience gained in battle! If you have not yet fully upgraded your Town Hall, you can still do so now. Use Upgrade Sketches to reach these new Building Levels and unlock the Special Bonuses they grant. You can get Upgrade Sketches from the Black Market, or earn them as part of certain in-game Events – like special Tournaments. Do not let your Craftsmen sit idle! Take advantage of these new Levels to make your Castle the most powerful in the realm!